Candles can be more than a light to accent your home décor; Jackpot Candles believes that candles can offer an experience that does not stop after the flame has died. Their hand-poured candles are made with 100% natural soy that creates a lovely, long-lasting flame to fill your home with amazing scents. Using only the best environmentally friendly materials, their candles provide bold, distinctive fragrances that fit any mood and any budget. Whether you crave the aromas of fresh baked holiday cookies and pies or the fresh, clean scent of flowering gardens and mountain breezes, their wide range of products will transform your home into a welcoming space of comfort and relaxation. But the scented candle is only the first part of the experience. After enjoying the soft light of the long-burning flame and the aroma of your favorite scent, each Jackpot Candle offers a foil-wrapped jewelry item you select, valued between $15 and $5,000. They carefully work to ensure that each 100% handmade in the USA wax product they make contains a jewelry item based on your selection. These jewelry pieces ensure that your candle experience lasts a lifetime. 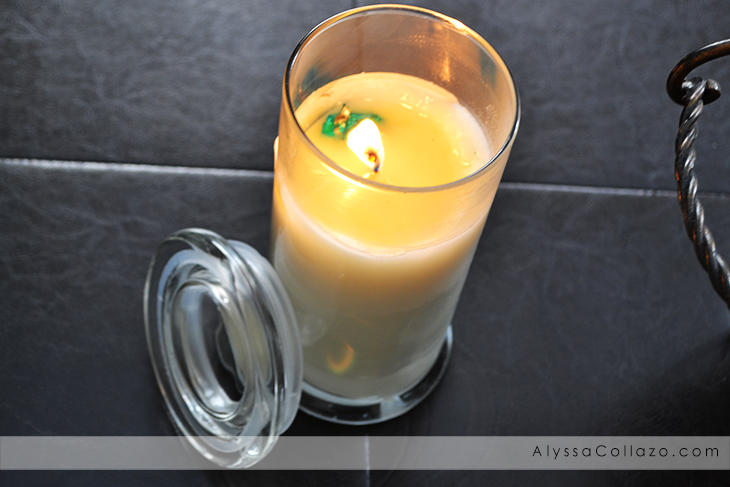 Here's how it works: Burn the candle and enjoy the fresh and bold fragrance until the foil wrapped pouch is revealed. Extinguish candle with snuffer and allow a short time for cooling. Remove foil wrapped pouch with tweezers. Unwrap foil pouch and discover your new jewelry piece. Visit their Appraisal page and enter your product code discovered on the label of your foil wrapped jewelry, for your instant appraisal. Jackpot Candles offer an experience of comfort with soft light and soothing fragrances and the jewelry hidden inside will add glamour and style to your look after the candle has finished burning. A perfect holiday treat, birthday gift, party favor, or treat for yourself! The necklace was inside a small plastic baggy, then wrapped in tin foil to protect it from the wax. After visiting the Appraisal page and entering my code I learned my necklace was worth $48.00. I love the colors on the pendent. It wasn't really my style, but my seven year old LOVES it and it's currently in HER jewelry box. I highly recommend everyone giving Jackpot Candles a try, even if it's just once! This company is unlike any other candle company. You have the choice between a ring, necklace or earrings. They have tons of Candle scents and you can even purchase Tarts! Jackpot Candles make the perfect gift for any occasion, I actually plan on ordering my mom and mother in law one for Mother's Day! 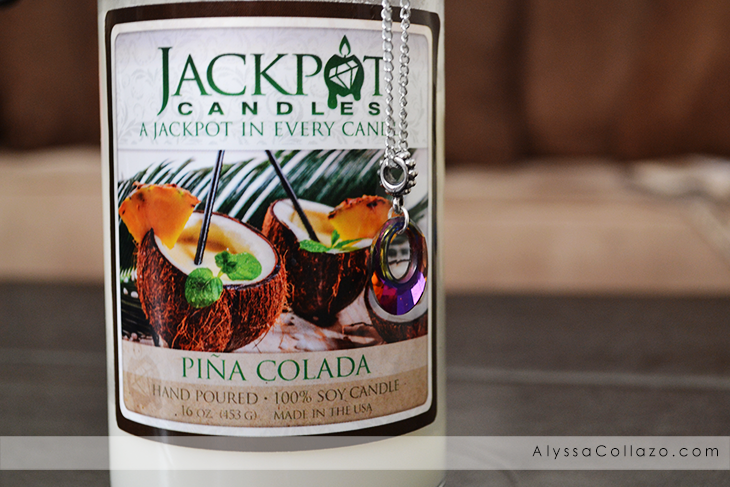 Jackpot Candles is giving one of my lucky followers a Candle and Jewelry of your choice! One (1) winner will receive: A Jackpot Candles of your choice! Ends 3.4.15. 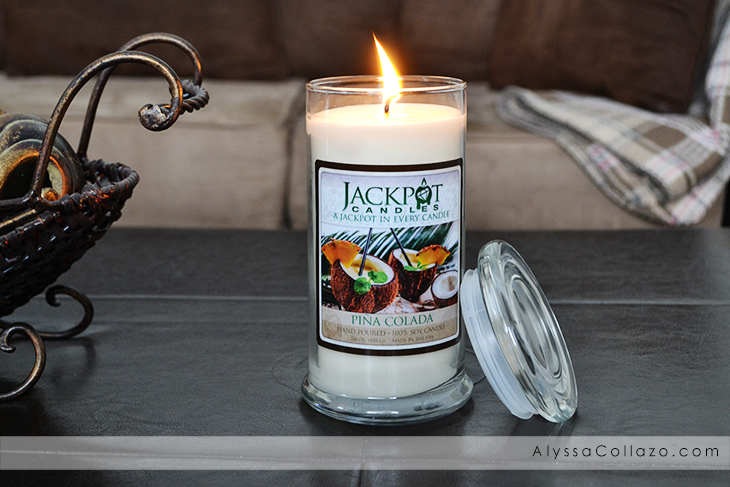 DISCLAIMER: All products received are complimentary for testing purposes from Jackpot Candles. All opinions stated are my own and are not influenced by any affiliates. I love the idea of these. I totally want to get one to see what I get for a prize. So much fun! It's so hard just to pick one but I think I'd go with birthday cake, one the whole family should like. What a great giveaway! I like the pina colada scent. That would make it seem like summer around here, which is perfect since we have freezing temps! This is so creative!! I would be so curious to see the prize! They all look great, but I would love to try Birthday Cake! I've heard such great things about these candles! I wish I could burn candles but I can't. But I plan on getting a few of these as gifts! I really love the sound of these candles, especially the surprise element. That necklace you got is so pretty. These candles look so cool. I love finding jewelry inside a candle. It's a win-win. Your house smells good and you get to find a surprise. I really want to try the lilac candle! I would love to try one of these candles. So pretty! Thank you! I totally want to win this! They are so pretty! Wow you found a great one in your candle. These are such fun ideas for gifts! Looks very cool. We love to have candles burning. Really sets a mood and the scents are incredible. Thank you for sharing. I love the ideas of these candles. I always have a candle burning I just love the smells. Candles like these are my absolute favorite. There is nothing better than the excitement. I like candles in my room. It relaxes and soothes me after a long day. I think it's fun to burn it and find the jewelry. I'm sure this is a great gift idea too! I'd really love Ocean Breeze, it would be amazing to enjoy the candle! I like Ocean Breeze. Would bring back fond memories of the beach. I would love the caramel coffee latte. I have never tried a jewelry candle and would love to try one. I'm a Yankee Candle girl through and through, but this sounds like so much fun! I might just have to get one! What an awesome concept! I love candles with prizes, it's like cereal prizes for grown ups! Piña colada is one of my favorite scents of all time. Thanks for the giveway! I'd love to try this candle out for myself. A pina colada scent? That is really interesting. I've never had a pina colada drink so I have no idea what the smell is. Now I am so curious. That is a really great concept for a candle. And I love that they're soy based, those are my personal favorites. I had the pleasure of trying out Jackpot Candles too. The experience is fun and exciting to see what you get in the end. I tried the Blueberry Muffin candle! I want to try the Blueberry Muffin scent. I'm obsessed with candles! I literally always have one lit! My favorite is vanilla because of how light it is. Pina colada would be good too! I have never had this candle brand before but I absolutely love candles. I will have to give this one a try. I've entered! Candles are one of my favorite ways to fragrance a house. I would love that Pina Colada! Love the concept! Isn't it great to find the surprise after the candle is done. Cucumber Melon sounds like a great scent! I think I'd like the birthday cake scent! I would love to try the Ocen Breeze scent the most. I'd like to try Cinnamon Sensation. I love spice scented candles. I would love to try the cucumber melon scent! OH I bet that candle makes it smell like you are on your own island. I love different scented candles. i want the pina colada candle! Id pick between the Jack Frost, hot fudge brownie and cucumber melon. I would love to be smelling the Lilac candle right now. Then I could close my eyes and believe that it was springtime. Oh I would love to pick the Cherry Blast Jewelry Candle! That would smell so good! I want to try the Birthday Cake candle!